Why is Agra called as a city of Mughals? Agra is a Yamuna River adjacent city which is positioned 206 kilometres south of the national capital, 58 kilometres south of Mathura, 125 kilometres north of Gwalior, and 378 kilometres west of the Lucknow – the state capital. The UNESCO World Heritage Site was first mentioned in the Mahābhārata epic, where it was called Agrevaṇa. The name of the 24th most populous in India was derived from a Sanskrit word which stands the border of the forest. What are the famous places to see in Agra? The people of Agra receive an annual rainfall of 724.8 inches, while July and August are the wettest months. Nevertheless, May and June are the hottest months, with an average 48°C temperature. With an average temperature of 31°C December is the coldest month of the Taj City. It features a climate between semiarid climate and humid subtropical climate. It offers hot and dry summers, mild winters, and a monsoon season. 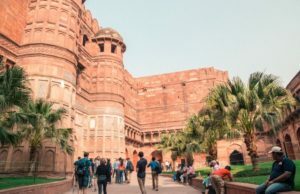 1000 BC: Even though it is believed that the Agra City was founded and developed by the Mughal Empire, there are mythological facts saying about an earlier existence of the city of Taj. As per Hindu epic Mahabharata, the city existed in 1000 BC. 1526 AD: Emperor Babur captured the city in this year. 1565 AD: Emperor Akbar is known as the building genius and structured several monuments around the centred Agra Fort. 1631 AD: Emperor Shah Jahan commissioned romantic marble structure, Taj Mahal. He made it with the help of 20,000 artists in memory of his beloved third wife, Mumtaz. 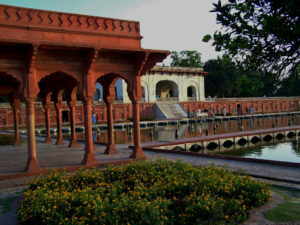 More than 40 Mughal Gardens are surviving in Agra. Four among them are under the management of the Archaeological Survey of India. The gardens that have changed over time are not well known to travellers as the Taj Mahal and Agra Fort. These gardens represent an extraordinary ensemble of Mughal heritage even after facing challenges of pollution and urban development. 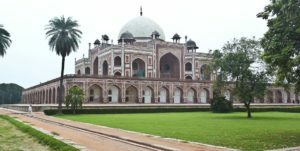 To restore these gardens, World Monuments Fund, in association with the Archaeological Survey of India, had launched a program in 2014.